Inviting your work colleagues - or worse still, your boss - into your home can be a complete and utter nightmare, and for some people, something they wouldn't even contemplate! Just the thought of them stepping over the threshold and into the hub of your family life can be totally terrifying - and that's without even taking feeding them and entertaining them into account! If your job entails entertaining on a regular and reciprocal basis, then you're going to have to get over your nerves, fast! After the first dinner party or soiree, you're sure to feel a whole lot better about future events - even if things don't go entirely to plan, you'll know what the 'weak spots' were and can find ways to overcome them and improve the whole experience next time around! One of the most important rules in entertaining - particularly if it is work colleagues - is not to try to over impress. It is a whole lot better to play down your home/culinary skills/children's proficiency in Mandarin than over exaggerate them and spend the rest of your time in your work-mates company waiting to be caught out! 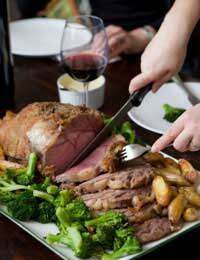 If you have a family or a partner or spouse, then obviously they need to be made aware of your dinner or luncheon plans, and hopefully, roped in to help. Discuss a simple menu, and don't go overboard with fancy or exotic foods that you have not prepared before - keeping everything relatively plain and straightforward will make for an easier ride in the kitchen, and less likelihood of a culinary disaster. If you do not have a designated eating area or separate dining room, clear the room you intend to eat in as much as possible before your guests arrive. Try to have clear space for people to mingle and chat in before they are seated for dinner, and ensure you have enough chairs for everyone to sit comfortably in before and after dinner. Occasional tables are a must for putting drinks down on, or for placing a few dishes of nibbles on - and make sure you have coasters and napkins on hand for your guest's convenience. Choose your seating plan with care. As host, you should sit nearest your boss. Do not automatically place the office 'buddies' together - especially if there are third parties who are not part of the clique or from other departments. Organise a seating plan that will enable people to talk to those they might not normally interact with, but with 'known faces' close enough to join in should the conversation run dry. If you have young children who spend the night getting in and out of bed and appearing downstairs, recruit a babysitter to keep them in their rooms or attend to them should they wake - the event will be stressful enough without having to worry about what your children are up to! Keep dogs and other animals away from your guests unless they express a particular desire to meet them - you might love the way Fido leaps up, paws on shoulders and licks your face, but your Managing Director may be less impressed. Offer plenty of soft drinks as well as alcohol and keep the water jug regularly replenished at the meal table. Keep an eye on your own alcohol consumption - after a few drinks in your own environment, all kinds of things might seem like a good idea, which, in the cold light of day could harm your working relationships and leave you embarrassed! Ask about dietary requirements and double check what your boss or colleagues eat - for example, vegetarians do not eat fish, and those on a low carb diet will not appreciate pasta and garlic bread! Make it clear whether or not you expect your colleagues to bring a guest - your whole arrangement could be ruined if your guests suddenly turn up with their partners unexpectedly in tow! Don't use a dinner party as an opportunity to ask for a pay rise or moan about other members of staff - keep certain subjects off limits and strictly for the office. Don't assume you and the boss are now best buddies just because you've bonded over a plate of risotto - maintain boundaries both at the table and once you are back at work. Relax and try to enjoy yourself - look upon your dinner party as a chance to build a better relationship between you and your work colleagues, and prove yourself a real team player!